The Historical Radio Society of Australia has 1,200 members who collect and restore old radios, typically from the 1920s to 1960s. Members enjoy advice, circuits, access to 50,000 valves, Meetings, Sales, Auctions, Events and a superb 64 page full-colour quarterly Magazine. Membership is just $40 a year, including the circuit service, access to member's only events and the quarterly colour magazine. HRSA website attack by a hacker - we are working on it. 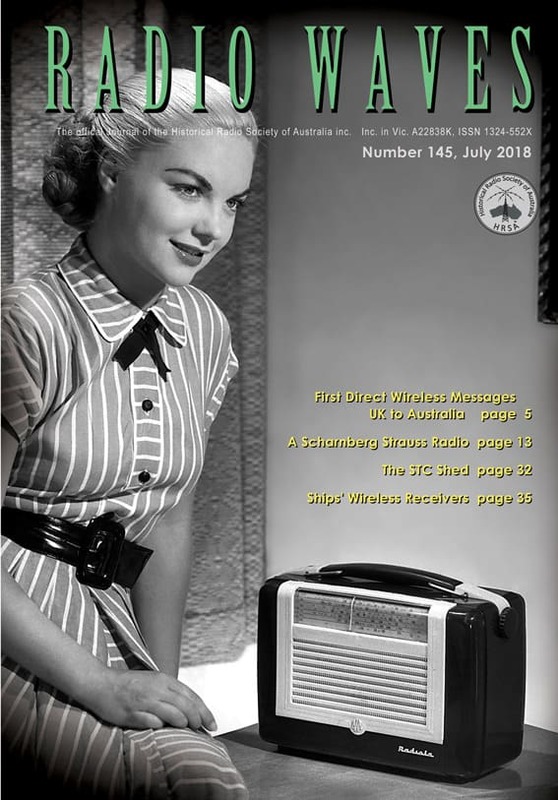 The magazine has features on how radios were restored by members, circuits, a huge classifieds section for obtaining parts, radios, and anything radio-related, events, news and much more. There’s a unique opportunity on Saturday 17-11-2018) to come to our regular meeting hall in Ashburton where a big Radio parts and Radios sale is being held. All from one vendor and very low prices, as they must sell everything! There's also a Mini-Auction of selected radios from the same collection. Starts at 12 noon with a quick meeting, then onto sales. The Corner of Victory Boulevard and High street, Ashburton. There’s parking in the grounds and also in the Church car park across the road - if they don’t have an event on. Enjoy the usual afternoon tea. No lunch supplied, so please shop on your way, or its a short walk to cafes in High street. 35th Anniversary was held in 2017. The next Anniversary is in Canberra. Previously known as the Moorabbin Town Hall. Becoming a member is easy and very low cost. The HRSA encourages people with an interest in vintage radio to join the Society. At just $40 a year, including the quarterly colour magazine, access to circuits and 50,000 valves plus parts and so much more, like monthly meetings and regular auctions, the HRSA has to be the best value. Yes, that’s not a typo, the Society has over 50,000 valves available for members, in an era when valves are often considered “as scarce as hen’s teeth”. Click on the HRSA logo (left) for Membership details. Members were able to join the HRSA for their 35th Anniversary Radiofest for three days at the magnificent Kingston Town Hall, Moorabbin, Victoria on April 7, 8, 9, 2017. Conditions of entry to the event, all days, members and public. The Historical Radio Society of Australia (HRSA) is Australia's largest Vintage Radio Society. Over 1,200 members around Australia and the world enjoy collecting old radios, often restoring them to like new. The Society also has an exceptional 64 page colour magazine quarterly. The HRSA encourages people with an interest in vintage radio to join the Society. At just $35 a year, including the quarterly colour magazine, access to circuits and 50,000 valves plus parts and so much more, like monthly meetings and regular auctions, the HRSA has to be the best value. After a very successful event in Melbourne during 2012, Canberra was the host city for RadioFest 2014. It was an unparalleled opportunity to marvel at or purchase most radio-related items from Marconi’s early days through to recent times. Sunday’s RadioFest sale and exhibition was open to all, with displays and a huge market of every conceivable Radio, parts, books and ephemera. Society members had access to the main trading hall early on the Sunday, from 8.30am, with the hall then open to the public from 9am to 3pm. 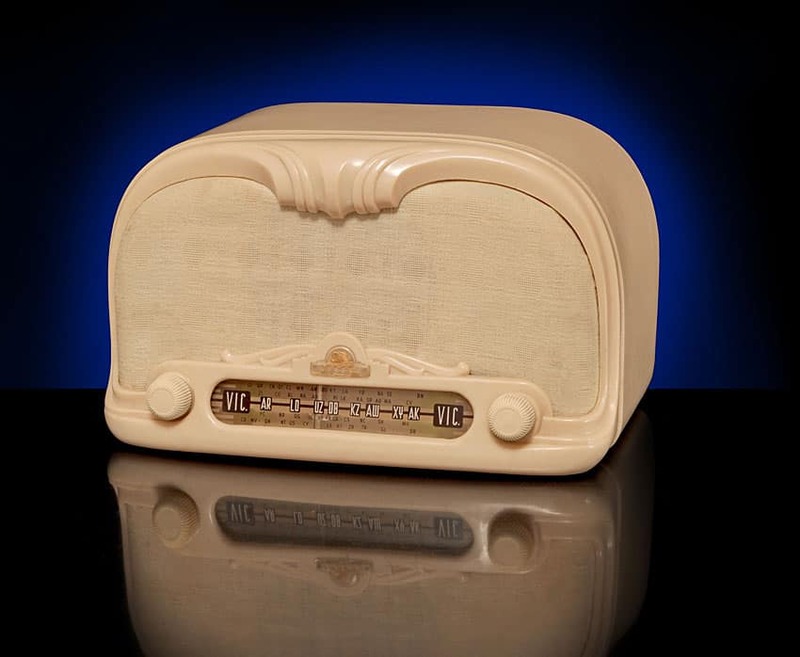 A highlight was the unique member’s-only auction of the Rare, Early and Unusual, featuring masterpieces from the dawn of broadcast radio in the early 1920s. 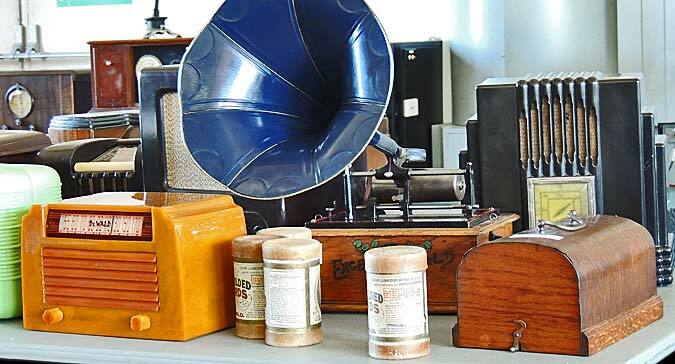 Superior to any previous Vintage Radio auction, there’s never been anything quite like it, with antique and unusual crystal sets, very early valve radios, spark gap transmitting coils, spectacular horn speakers, everything “top shelf”. 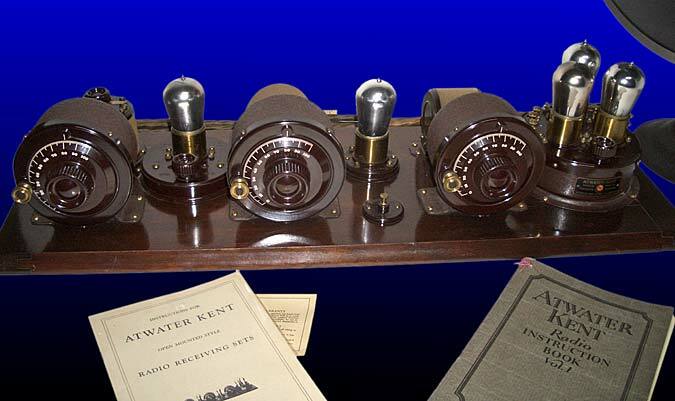 Above: An immaculate 1924 Atwater Kent Breadboard radio, complete with the original A-K horn, literature and superb craftsman-built glass display enclosure. 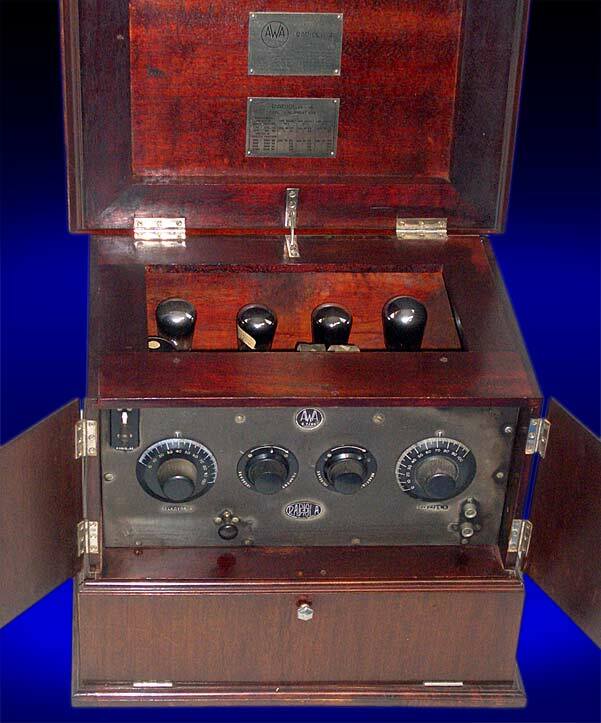 Above: also in the Auction, was an extremely rare example of AWA's first commercial tunable radios, the 1925 Radiola 4 model C7/60 in a smoker's cabinet. Saturday night’s dinner for members was an amazing opportunity to mix and chat with enthusiastic radio collectors and restorers from all around Australia and even overseas members. Some members were in the radio business in the 50s, so stories abound. Great food and company was supported by the leading speaker, David Kilby from the ABC. 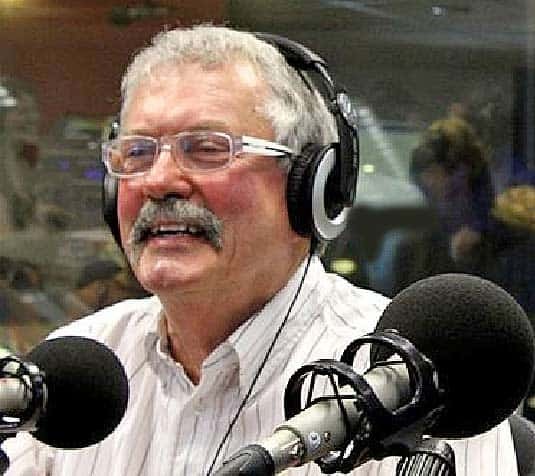 Well-known for his Rare Collections program (Sunday nights 9.30pm) on Radio National, he was at his funniest, most informal best.